Arnie Wishnick, who was named Pride of the Palisades in December, was named the Pacific Palisades Rotary Business Person of the year. He is surrounded by wife Jackie (left) and Bobbie Faberow. 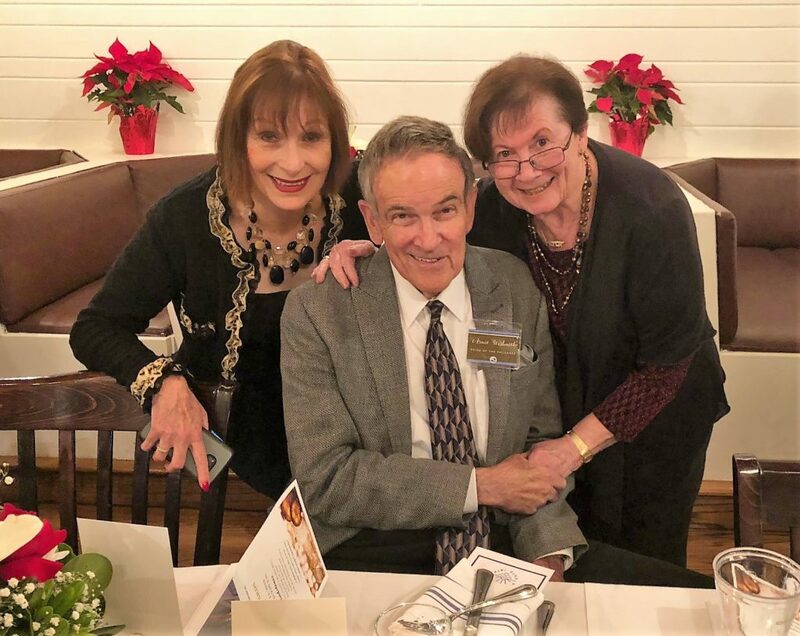 It was unanimous among Pacific Palisades Rotarians that Arnie Wishnick should be named the 2018 Rotary Business Person of the Year. The much-beloved Wishnick served as Chamber of Commerce executive director from 1993 until August 2018, when he retired and was replaced by Bob Benton. During Wishnick’s 25-year reign, the Chamber was an open door to residents, business owners, and visitors alike. He always had a kind word, an interesting tidbit of community news and a treat for any dog that happened to stop by with an owner. Wishnick integrated himself into all areas of the community including working with the annual teen pageant, serving as a producer for musical productions at Theatre Palisades, and playing an active role with PAPA (the Palisades Americanism Parade Association). He liked to note that his job for PAPA was twofold: finding a celebrity grand marshal and making sure there were porta-potties along the parade route. His first grand marshal was TV weatherman Fritz Coleman, followed over the years by the likes of Anthony Hopkins, Monty Hall, Art Linkletter, Pat Boone, Jerry Mathers, Linda Blair, Casey Kasem, Patti Page and famous athletes such as Rafer Johnson, Jim Brown and Steve Kerr. In 2018, Wishnick was named the Palisades Fourth of July Parade Marshal for his long-time volunteer efforts. 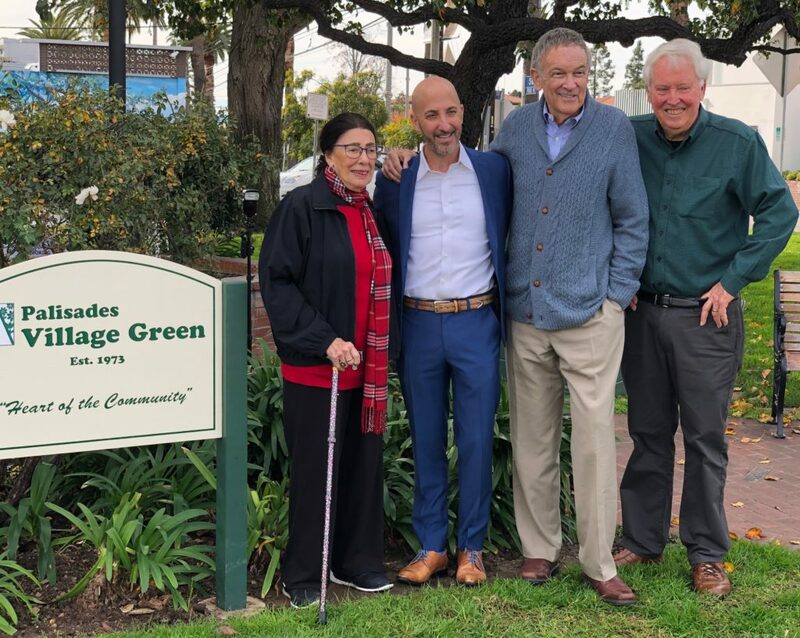 Last December he was honored as the Pride of the Palisades by the Community Council. Earlier in his activist “career,” he received a Golden Sparkplug award in 1980 and the Lions Club Citizen of the Year award in 1984. Every two years or so, Wishnick also was responsible for finding a new Palisades Honorary Mayor. He recruited John Raitt, Bob Saget, Eddie Albert, Martin Short, Anthony Hopkins, Steve Guttenberg, Gavin MacLeod, Sugar Ray Leonard, Jake Steinfeld, Kevin Nealon and the Crystals, Billy and Janice. Wishnick is a past president of the Optimist Club and a member of the Palisades PRIDE committee. At the Chamber, he helped promote businesses in the Palisades by encouraging monthly mixers that were available to all, the annual Sidewalk Sale, the polo tournament, Holiday HO!HO!HO!, the auto show and health expo and village fairs. Wishnick was active on the Village Green committee, helping the nonprofit find ways to pay for maintenance. (Left to right) Joan Graves, Anthony Marguleas, Wishnick and Bill Bruns. Wishnick worked with all people and opened the Chamber doors to groups that needed a place to meet, such as the Palisades Design Review Board and the Village Green Committee. He gave thousands of hours of his time as an active member on the Village Green Committee and PRIDE. Long-time friend Bob Vickrey noted that no matter how he might prod Wishnick to give a strong opinion about someone who deserved a scolding, Wishnick always stayed even tempered, building bridges among people in the community. There isn’t a mean bone in that man’s body. Rotarians, who live by the motto, “Service Above Self,” feel that Wishnick best exemplified that saying not only in his business dealings, but also in his personal life. And Wishnick, the businessman, the mediator, a Pacific Palisades promoter/volunteer–and a kind soul–made him the logical choice. The award was presented at his home last week by Rotary President Brett Bjornson and member Perry Akins. Even as early as 1994, residents were appreciative of Wishnick. 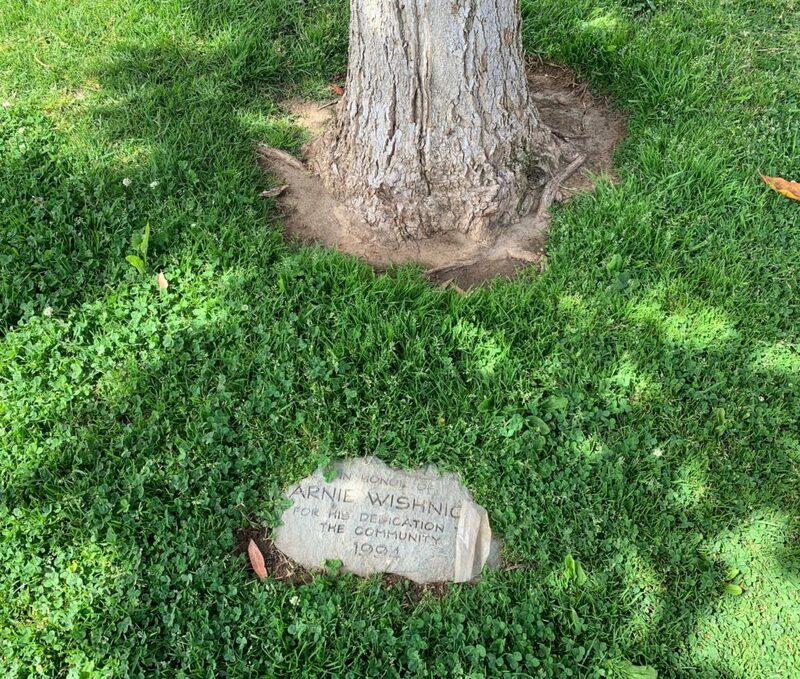 A tree by the Palisades library was planted in his honor. Truly the very best ! I didn’t know about the tree. That is really touching. Thanks for sending this around Bob. Arnie is a wonderful man! I am so grateful I can call him my friend. We share the love of animals. Particularly DOGS! Congrats Arnie on the award! It is well deserved!! A well deserved honor indeed! !